I am actively working through a list of all of the activities that I would like to do in Colorado. There are a ridiculous number of events and fun shenanigans to take part in. In fact, there are so many fun things to do in Denver, it can be a bit overwhelming. And, I find myself having to choose between 3-4 awesome events a day (especially during summer). Here’s a super incomplete list of things that I’m hoping to do this summer. What would be on your list of fun things to do in Denver? Go to Yoga on the Rocks-DONE! I love this list of fun things to do in Denver. It is crazy to me that it has taken me YEARS to get to Yoga on the Rocks. 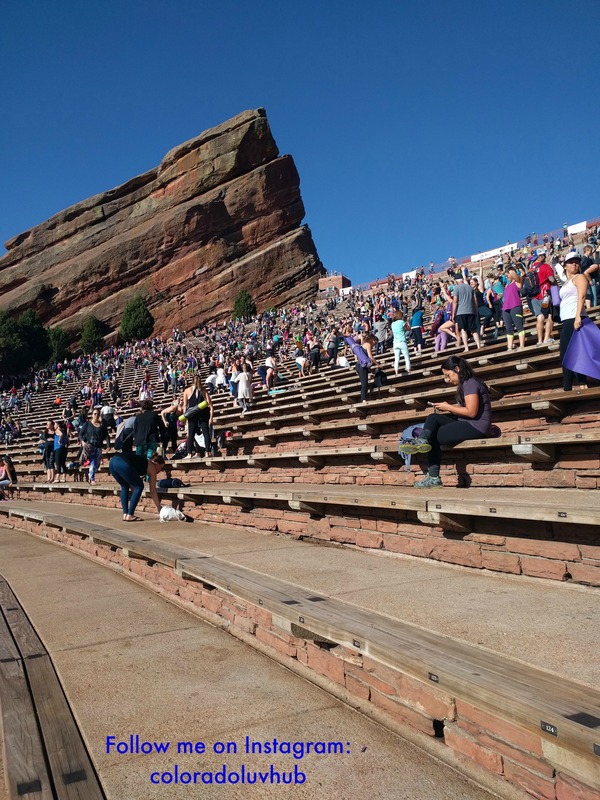 For those of you who don’t know what it is, every Saturday for the entire summer, different yoga studios/instructors will run a class at Red Rocks. If you are interested in going for this summer it is already sold out. Yep, for the entire summer. Crazy. In fact, I started looking at ticket purchasing information around March. Because I got sick of missing out. This year, I was able to purchase tickets for a class at the beginning and end of summer. On June 3rd, me and several thousand of my closest yogi friends. Namaste in shape this year and going to Yoga on the Rocks was a part of my plan. It was awesome. I wanted to share some tips with those of you who would like to attend next year so that you can avoid some of the mistakes that I made. This is tip is HUGE. Around mid-March like the Red Rocks Facebook page so that you are in the loop and set a couple of reminders in your Google Calendar so that you don’t forget to purchase your tickets. This event WILL sell out (like the Derby Party). Just accept it and plan accordingly. Once you’ve purchased your tickets don’t forget to set reminders in your calendars so that you don’t forget that you’re going. This year I had two friends who purchased tickets but they forgot and ended up going jogging instead of to the event. They remembered after I texted them asking “where are you? !” Oops. I made the mistake of arriving late. It said that the class would start around 7:00 am…so I thought that it was a time suggestion vs. the actual start time. No arriving at 7:00 am and mingling. The class starts at 7:00 a.m. Nope, that wasn’t the case. Myself and hundreds of other people were frantically trying to get into the park, park our cars, climb up the stairs (and every time I climb the stairs, I get out of breath.) Find a spot and then get into our practice. I arrived at 7:15 am (class started at 7:00 am) and ended up right next to the stage. Every single row, every single space was taken. Because I arrived late I was unable to check my space and make sure it was a good place for me to do yoga. Uneven texture on the ground. This may be hard on your knees-so head’s up! Food remnants-I had the misfortune to put my mat next to a jalapeno slice. I kept wondering where the smell was coming from until I was able to figure out where it was. Too close to me! Ok, remember, Red Rocks is at the base of the mountains. The temperature can and will fluctuate because of the location and early time of this event. Wear layers! It will probably be chilly earlier in the day, then, it will get hotter. Take off the layers. Bring padding to put underneath your knees. I didn’t have one and actually, I would like to always have one in general. Here’s a link to show what I mean. Water! It’s Colorado. You will get dehydrated and you’re working out at altitude-bring a water bottle. Snacks-After working out you’ll probably be a little hungry. Don’t forget to bring some fruit, snack bars, etc. for after the class. Don’t forget to go to the top 0f the stairs and check out the sponsors (usually a couple of food tents and clothing for sale). There also are nice clean bathroom facilities in the Trading Post/Visitor’s Center. The entrance is located at the top of the stairs in a kind of circular structure with stairs leading downwards.